Silver Spring is in southern Montgomery County, Maryland, just north of Washington, D.C.
Review the latest and most accurate housing data for Silver Spring, MD. 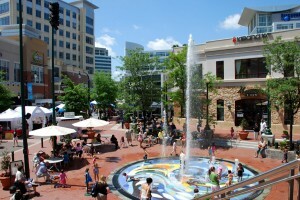 Downtown Silver Spring, located on Georgia Avenue just two blocks from the Silver Spring MARC station, combines a vibrant, laid-back atmosphere with an eclectic mix of dining, shopping, and entertainment. Anchored by Whole Foods, Regal Majestic Theater and with restaurants including Panera Bread, Macaroni Grill, Potbelly Sandwich Works and Copper Canyon Grill, Downtown Silver Spring is in a class by itself. Upscale retailers include LOFT, New York & Co, DSW, Metamorphosis, Ulta, Gymboree and City Sports. Guests can enjoy year round activities including concerts, arts & craft fairs, cultural festivals and a farmers market. From the mosaic tile steps and interactive fountain, to the diversity of the restaurants and shops, Downtown Silver Spring truly has it all! From May through September, the interactive splash fountain will be open from 10am-9pm on Ellsworth Drive (subject to change due to weather, inspections, maintenance checks and public safety). According to figures released by the U.S. Census Bureau in 2010, the community had a total population of 71,452. Downtown Silver Spring is home to a wide variety of family-owned restaurants representing its vast ethnic diversity. As downtown Silver Spring revived, its 160-year history was celebrated in a PBS documentary entitled Silver Spring: Story of an American Suburb, released in 2002. In 2003, Discovery Communications completed the construction of its headquarters and relocated to downtown Silver Spring from nearby Bethesda. The same year also brought the reopening of the Silver Theatre, as AFI Silver, under the auspices of the American Film Institute. Development continues with the opening of new office buildings, condos, stores, and restaurants.